I have heard many, many rumors about where my relatives came from and I'm not sure which one is right. My mom always told me never to repeat anything for a fact that I didn't know was the truth, so I guess I won't tell you my family history. I really like people, but my first love is working with livestock. I can herd anything on four legs, and I sometimes play at herding humans, just for the fun of it. I might enjoy being a family pet, but only if you have a place for me to run and exercise. My herding instinct is very strong, so it is frustrating for me not to have any livestock to work with. I need to stay fit. When fully grown, I am between 18 and 23 inches tall (45.7 to 58.4 centimeters) and I weigh between 35 and 70 pounds (15.8 to 31.5 kilograms). We have no Australian Shepherd Breeders listed at this time. 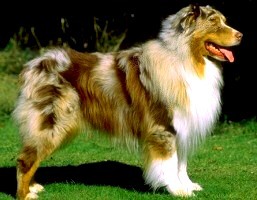 Click here to place your Australian Shepherd Ad!